Jose Mourinho is no stranger to controversy. Supposedly circumventing a touchline ban by hiding in a laundry basket and arguably playing a part in the forced retirement of top referee, Anders Frisk, with his comments after Chelsea’s defeat in Barcelona are just two of the many controversial incidents that Mourinho has found himself at the centre of. And once again, he is back in the headlines. It started in the 87th minute of the Champions League game in Amsterdam. Real Madrid had put on a masterful performance to crush Ajax and found themselves 4-0 ahead and through to the knockout phase. Xabi Alonso, already on a yellow card, placed the ball down to take a free kick. After gently wandering back to about a fifteen yard run-up, he proceeded to fake taking the kick six times before Scottish referee, Craig Thomson, decided to show him a second yellow card. There was no look of disappointment from Alonso, who just turned and headed for the dugout. Then less than three minutes later, Real Madrid had a goal-kick. For some unexplained reason, Sergio Ramos decided to take the kick. After placing the ball, he adjusted the tape on both socks, rolled them back down, faked to take the goal-kick once, at which point Craig Thomson showed him a second yellow card. With no complaints, Ramos shook the hand of the referee and headed for the dugout to join Alonso. So the two players will serve a one-match suspension against Auxerre in a dead rubber for Madrid, and will be back with a clean slate for the knockout phase. Cynics might suggest there is something suspicious going on. 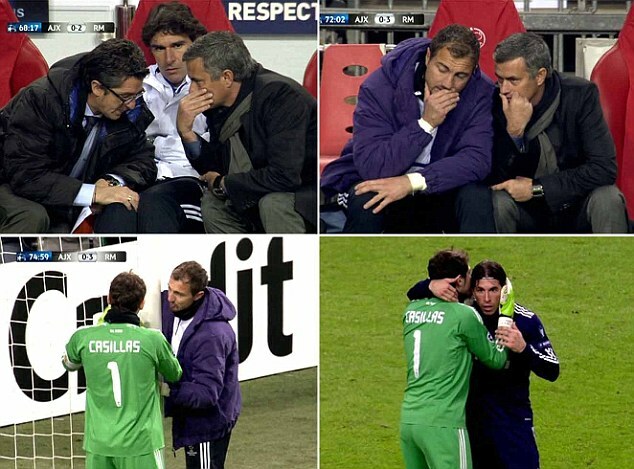 If we look closely at Mourinho through this episode, we see something interesting. Just before Xabi Alonso received his second yellow card for time-wasting, he spoke to Mourinho on the touchline. Moments later, he was headed back to the dugout. We then see Mourinho speaking to substitute keeper, Jerzy Dudek. Dudek then speaks to Iker Casillas and Sergio Ramos. Moments later, Ramos is heading back to the dugout. It doesn’t take a genius to see that there is definitely something dodgy going on. Real Madrid are denying anything untoward has happened. Ramos claims he did not deliberately get given a second yellow card. Casillas has claimed that Dudek was enquiring about his stomach problems, and that he told Ramos to keep an eye on one of the Ajax strikers. 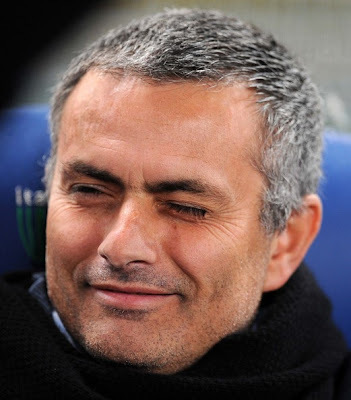 Mourinho has claimed that Thomson was at fault and has questioned the standard of Scottish refereeing. But the question remains – should UEFA really do anything? There is an argument that they have brought the game into disrepute by their actions. But at least they acquired the second yellow cards through time-wasting. They could easily have just fouled Ajax players to get second yellows, potentially putting the Ajax players at risk of injury. It is not as though this type of thing has not happened before. The highest profile occurrence was England captain, David Beckham, deliberately getting himself booked against Wales in a World Cup qualifier back in 2005. He admitted that he had picked up a rib injury and knew that he would miss the next match anyway, so by picking up a yellow card, he got his suspension out of the way in a game he would not have played in anyway. A smart move, until he explained it to the press. Indeed, back in 2006, Lyon pair, Cris and Juninho Pernambucano, were fined a combined €25k for deliberately getting booked to miss a dead rubber group match. It would be a surprise if UEFA took any further action than just fining the two players. They have already set the precedent for this in the Lyon case, so are likely to just follow that. It is a farcical situation, but it is hardly the worst thing ever seen on a football pitch. The commentator last night described it as blatant cheating and that they should be punished with a longer suspension. As far as I am concerned, it was clearly not in the spirit of the game, but any further punishment other than a fine would be ridiculous. If football’s governing bodies are not willing to extend bans for terrible and dangerous tackles, but are happy to do so for a stupid bit of time-wasting, what does that really say about the state of football today?